Reset odometer at Tule Well. "The winter sun was bathing the desert in its golden warmth the day we left and the brittlebush by the cave camp was a mass of yellow bloom. Everything was saturated in that dry, radiant warmth – a warmth that only the desert knows. As we heaped the last of our belongings in the truck, as we climbed in our usual places, I beside Dad on the seat, Cap behind on the canvas-covered load – as the truck carried us down the trail and we turned our backs to the brush shade, to the battered tent, to the friendly boulders that had sheltered us so long, I knew that I was leaving my real home. And I knew just as surely, that some day not too far away, I was coming back." Olga Wright Smith, Gold on the Desert. This leg loosely approximates the popular route used a century or more ago when travelers afoot or horseback connected three major waterholes between Las Playas and the Gila River north of Tacna. Sometimes called the Cabeza Prieta route, it left Las Playas and headed north across the Pinta Sands to Heart Tank. From there it went west to Cabeza Prieta Tanks, a set of tinajas secluded in a side canyon northeast of Cabeza Prieta Peak. Then travelers pushed north to Baker Tanks, known on old maps as La Tinaja or La Tinaxa, south of Baker Peaks. Their final push was north to the Gila River, which promised not only water but forage for their horses. Kino took this route several times, as did others, for it was a safer route with shorter distances between reliable waterholes. The gold-fevered 49ers preferred the more direct but riskier route from Tule Well to Tinajas Altas and on to Yuma. Mile 0.0. 32°13’35”N, 113°44’59”W. Tule Well. Take road northeast (turn right). Emergency water may be available at Tule Well from a spigot at the storage tank fence, but it is not approved for drinking, and even when boiled its saltiness makes poor coffee. Mile 0.2. Big washes like this one are important habitat for a variety of wildlife, as well as home to a variety of trees and shrubs. The wash provides values for wildlife, such as a travel corridor and bird nesting habitat; it functions as shade, food, and a hospitable microclimate with cooler temperatures and higher humidity, perhaps even providing water in short-lived pools. As you go…. Miles 0.6 to 1.8: cinder flats with occasional desert pavement populated by ocotillo (Fouquieria splendens ssp.splendens), creosote (Larrea tridentata), saltbush (Atriplex canescens), saguaro (Carnegia gigantea), paloverdes (Parkinsonia microphylla), and seasonal desert sunflowers, and devil’s spineflower (Chorizanthe rigida). A stroll across the flat will reveal many more seasonal flowers, including purplemat (Nama demissum) and Mojave desertstar (Monoptilon bellioides). Mile 2.1. 32°14’23.2”N, 113 °43’06.0”W. Picturesque smooth peaks to right (east) of road. The basalt flows, tuffs, and agglomerates in this area are Miocene age. These graceful rocks deserve an official name. As you go…. Mile 3.0: Distinctive mountain of tilted rock layers straight ahead (east). As you go…. Miles 3.5 to 4.4: colored hills and old mining claims marked by cairns and test holes. The claims in the next few mines include the Halo Group, Last Chance, High Grade, Gold Johnny, Leona, Mary, and finally Dan Drift’s Mine (that’s its name) and his Dart & Kart (aka Tillie Pat). Imagine a campfire where we could ask these old-timers about their diggings and dreams. What an evening that would be! Most of these claims gathered enough ore to file a claim, but not enough to file a production report. Mile 4.5. 32°15’15.0”N, 113°40’58.7”W. Closed administrative trail to Senita Tank, now suitable for walking. 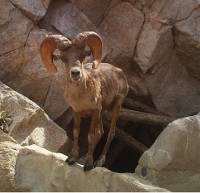 The wildlife water built for bighorn sheep (Ovis canadensis mexicana) in 1957 is at 32°15’24”N, 113°40’35”W. A lone senita cactus (Lophocereus schottii) was reported east of the Drift Hills and is namesake for the game tank. In Organ Pipe Cactus National Monument senitas prosper in a basin near the border, but few others are found in the park or in the refuge, though they are common south of the border. The senita (Lophocereus schottii v.schottii) vaguely resembles an organ pipe cactus (Stenocereus thurberi), but it has fewer flutes (ribs), thicker stems, and mature individuals have hoary gray bristles near the branch tips. Smoke trees (Psorothamnus spinosus), blue paloverdes (Parkinsonia florida), mesquites (Prosopis velutina), and other trees and shrubs line the wash creating photogenic and rich habitat. Distance from junction to wash is about ¼ mile one-way, then walk up or down wash to your heart’s content. The tank is about ½ mile one-way – follow old trail east and then north into the canyon. "I walked in the garden often these last days, preferably alone, and looked lovingly at my clumps of brittleweed, my fine beds of desert holly, my borders of paper daisies and desert marigolds. Fresh, after the autumn rains, the plants seemed to be putting forth their best efforts, now that I would be walking among them no more. Here, tended by unseen hands, grew plants equal to any in a botanical garden. They seemed to flourish for me alone, just as the birds seem to sing for me alone. There was no one else to see them, just as there was no one else to hear the birds sing." "Few can resist the spell of the desert or willingly neglect its call in the stress of ills of body or of soul. The geologist [WJ] McGee, in the extremity of nervous breakdown, sought and found new life on the Old Yuma Trail." And we believe that Dan Drift did too. Mile 6.4. 32°16’38.2”N, 113°41’38.9”W. Christmas Pass. Narrow spot in the roadway – use caution. Route rough-hewn out of bedrock by Dan Drift for his re-supply trips to Wellton and he finished on Christmas day. Mile 6.5. 36°16’39”N, 113°41’33”W. 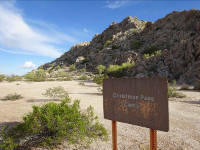 Christmas Pass campground. No facilities, but sizeable parking and beautiful vista, especially at sunset when distant mountains glow orange and red. Scramble on rocks or investigate plants on the slopes. Sierra Pinta is to the east. Its mid-range contact line between lighter colored granite to the north and darker gneiss to the south is obvious. Mile 8.7. 32°17’45.4”N, 113°40’01.4”W. Junction. Go straight ahead (north). Rescue beacon and administrative trail to Heart Tank. Note soil layers, root systems, and abandoned rodent burrows in erosion banks along roadway. Heart Tank is a natural perennial tinaja on the west slope of Sierra Pinta, 0.7 mi northwest of the range’s summit (BM Pinta, 2,950 ft). Heart was named for its heart shape when full, and it was Padre Kino's Aguaje de la Luna (Water Trough of the Moon – he arrived at night), which he visited and gratefully used in 1699. As you go…. Miles 8.8 to 9.6: The road parallels and at times merges with Mohawk Wash. Big galleta grass (Hilaria rigida) thrives along wash, taking advantage of extra moisture in road soil, and to both sides of the roadway are nearly pure stands of creosote (Larrea tridentata) and bursage (Ambrosia ambrosioides). A favorite hunting ground for kestrels. The Indians of this region seldom used horses when they became available, because horses or other livestock require feed and water, both in short supply out here. 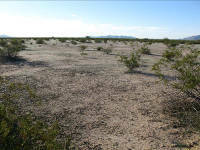 Early padres, soldiers, travelers, and surveyors commented on the lack of feed and rejoiced when they found patches of big galleta, seasonal grasses, or paloverde and mesquite beans. Those of us longing for the good old days should remember what it was like catching and saddling horses each morning, hitching the wagon, or packing our worldly belongings on mules, all on top of finding food and water for them. Little of this valuable grass grows in the flats above the road. Mile 11.3. 32°20’03.8”N, 113°39’39.5”W. One of the largest ironwood trees (Olneya tesota) on the refuge stands close by the road. Several species of hard to identify “little brown birds” use the roadway habitat during the year. They seem to conspire against identification, though the suspects are many, including: black-tailed gnatcatchers (Polioptila melanura), Bewick’s wrens (Thryomanes bewickii), house wrens (Troglodytes aedon), and the challenging sparrows such as Cassin’s, white-crowned (Zonotrichia leucophris), chipping (Spizella passerina), Brewer's (Spizella breweri), black-throated (Amphispiza bilineata), sage (Amphispiza belli), and vesper, and house finches (Carpodacus mexicanus), all flying ahead of our cars to further confuse us. And to make matters worse, in winter they may all flock together. Valleys in this region are home to a large portion of the US population of Le Conte's thrashers, and you may spot cactus wrens (Campylorhynchus brunneicapillus), horned larks (Eremophila alpestris), and an occasional greater roadrunner (Geococcyx californiana). Near rocky terrain and trees you may spot an ash-throated flycatcher (Myiarchus cinerascens), Say’s phoebe (Saya ornis), loggerhead shrike (Lanius ludovicianus), or verdin (Auriparus flavicepes). The Le Conte’s thrasher (Toxostoma lecontei) may be new to you. These birds have a long, strongly-curved beak that they use to ‘thrash’ the soil and ground litter as they search for arthropods to eat. Good field marks for this species are its long beak, long tail and overall pale color. If the bird fleeing from you has a long tail, is nearly the color of the desert sand, and appears as if it would rather run than fly, then it may be a Le Conte’s Thrasher. Scientists and conservationists are concerned about the future of Le Conte’s Thrasher, which is only found in the arid deserts of Arizona, Nevada, California and Mexico. 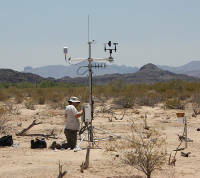 Human development has decreased the distribution of the species, particularly in southern Arizona and southern California. Climate change may push the birds toward the limits of their physiological tolerance. Currently, the wide, sparsely-vegetated valleys traversed by the Camino contain some of the densest and most viable populations of this species in the United States. Please do your part in helping to conserve this unique bird by treading lightly across its habitat. Mile 13.0. 32°21’32”N, 113°39’57”W. Administrative trail to North Pinta Tank, a water tank constructed in 1951 for desert bighorn. It is a 1.9-mile (one-way) stroll to the tank. Red-tailed hawks (Buteo jamaicensis) hunt here, and keen-eyed observers may see an occasional golden eagle (Aquila chrysaetos) soaring above any of the region’s mountain ridges. Northern harriers (Circus cyaneus) cruise low over the creosote flats, while Cooper’s hawks (Accipiter cooperii) and sharp-shinned hawks (Accipiter striatus) hunt the canyons and wooded arroyos. Prairie falcons (Falco mexicanus) prefer cliffs and canyons. As you go…. Miles 13.4 to 15: Notice differences in size between creosotes (Larrea tridentata) next to the road/wash and those beyond. Along the wash we find more and larger creosotes and a fuller variety of smaller plants due to the extra runoff. 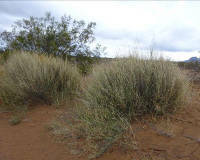 In turn, a wash provides a richer habitat that can support more species of wildlife due to more forage, shade, and protection, especially in the paloverdes (Parkinsonia aculeata), mesquites (Prosopis pubescens), and catclaws (Senegalia greggii). Mile 15.1. 32°23’20.9”N, 113°40’10.9W. One of the largest blue paloverdes (Parkinsonia florida) on the refuge stands beside the road. The past decade has been drier and warmer in this region, killing or stressing a number of large trees. Mile 17.1. 32°25’06.3”N, 113°40’12.8”W. Northern boundary of the Cabeza Prieta National Wildlife Refuge. Northbound travelers are entering the Goldwater Range, and southbound travelers must check-in at the Cabeza Prieta kiosk. You may find a reasonable campsite here, especially after dark. Structures on the hill to the east belong to the US Marine Corps. Examine creosotes carefully. You may see the creosotebush grasshopper (Bootettix argentatus), the desert clicker (a grasshopper with the name Ligurotettix coquilletti), the creosotebush katydid (Insara covilleae), a creosote bush walkingstick (Diapheromera covilleae), and a green jumping spider aka green lynx spider (Peucetia viridans) – all of them cryptic, green-colored, and living primarily within creosotebushes. Oh, and you may spot a green-colored praying mantis. Green coloration helps them hide among the leaves, but they also find moisture and food and can reproduce there. You may already “know” the desert clicker, though you may not have been sure what kind of “bug” it was. The desert clicker is conspicuous because of the loud, seemingly incessant clicking sound it makes, plus when seen, it quickly slips around to the other side of a branch, playing hide-and-seek with you. Other common desert grasshoppers include the pallid-winged grasshopper (Trimerotropis pallidipennis) and horse lubber (Taeniopoda eques). And in the sands below a creosotebush you may find solpugids, scorpions, geckos, and a variety of insects. 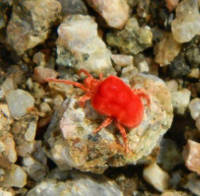 Following rains you may see the sand come alive with vivid “red velvet mites” (family Trombididae), about the size of a pea. Because they live underground and appear as if by magic, they are known regionally as “sand babies.” They are harmless and beautiful. Too, on your trip you may have noticed fuzzy red, orange, white, or yellow-colored “ants” scurrying across the ground. They avoid people but are attractive. Some jokester may encourage you to pick one up and hear its faint “squeak,” but these are not ants – they are wingless wasps (family Mutilladae) that pack an eye-opening sting. Foremost on the pain scale is the large “tarantula wasp” (Pepsis formosa), orange and black hunters that feed on other insects, particularly caterpillars, and on the nectar of milkweeds. They lay their eggs in tarantulas paralyzed by their sting. One insect expert, Justin Schmidt in his book The Sting of the Wild (2016), rates the pain of the tarantula wasp’s sting at the top of the scale, alongside the bullet ant of the South American jungle, but fortunately tarantula wasps ignore people unless pestered. Mile 17.4. 32°25’23N, 113°40’07W. Point of the Pintas. Campsites north and south of hill west of the road. A traditional spot to watch the sunset. An administrative Border Patrol trail running eastward is closed to public vehicles. As you go…. Miles 18.5 to 19.5: Watch for black-tailed jackrabbits (Lepus californicus). Jacks are hares, precocial mammals, that are born furred and seeing, plus they can hop within a few hours of birth. The other rabbit you’ve seen on your trip is the desert cottontail (Sylvilagus audubonii), a true rabbit, born blind, naked, and helpless. Jacks prefer open terrain and rely on their amazing speed and leaping ability to escape predators, while cottontails are quick but prefer dense brush for cover. As you go…. Miles 19.5 to 20.5. Cryptobiotic crusts act as a living skin for the desert. Dark patches between creosotebushes on both sides of road are communities of algae, moss, tiny invertebrates, cyanobacteria, and fungi. Together they help retain moisture in the soil, add nutrients for plants, and reduce erosion. A free USGS book on cryptobiotic soils is available on the web if you search “A Field Guide to Biological Soil Crusts of Western U.S. Drylands” by R. Rosentreter, M. Bowker, and J. Belnap. Solitary trees growing among these creosote flats look conspicuous. In warm seasons watch for desert iguanas (Dispsosaurus dorsalis), a lizard that eats plants including creosote leaves and flowers as well as insects and carrion. Both triangle leaf and white bursage mingle along the road. As you go: Mile 20.6. Mohawk Mountains stand straight ahead (north). As you drive north you can start to see the tan line of sand dunes along the mountain base. Mile 22.3. 32°29’31.5”N, 113°40’50.3”W. Mohawk junction. A Border Patrol drag road running east and west is used to track tire and foot prints of smugglers and border crossers; rescue beacon. A provisional campsite, especially if arriving in the area at night. And Border Patrol has rescued many people here. In the words of Joe McCraw, who was raised in Wellton and retired as head of Wellton Station, “I loved the Patrol. Best job I ever had. Some people said I was working too hard out here, but I was just having fun. The thrill is tracking 'em up before they die. It’s a rough ol' way to go -- run outta water in this desert.” His story and those of other agents from the Tacna-Wellton Station are featured in the book Desert Duty: On the Line with the U.S. Border Patrol (University of Texas, 2010). As you go: Miles 25.7 to 26.5: Note changes in the look of the creosote flats: smaller bushes mixed with more ratany, bursage, cholla, big galleta…and rodent burrows. If you’re seeing rodent tracks with a tail line behind the feet, the best guess is a kangaroo rat. And if you’re seeing rodent tracks, you may spot the distinctive S-loops of the sidewinder rattlesnake. As you go: Miles 26.5 to 27: Note fewer creosotes in the flats, and many more big galleta (Hilaria rigida) and bursages (Ambrosia confertiflora). And some barrel cactus (Ferocactus cylindraceus) have appeared. What changed? Mile 29.2. 32°34’23”N, 113°44’32”W. Mohawk Dunes. A cool-weather hike east to the edge of the nearest dune is about ¼ mile and another 1 mile to the crest. Rodents here include round-tailed ground squirrels (Spermophilus tereticaudus neglectus) and kangaroo rats (Dipodomys deserti arizonae), plus a variety of birds, snakes, and lizards, including, a sand-loving lizard, the Yuman Desert fringe-toed lizard (Uma notata), which dives into soft sand and “swims” underneath to hide from predators or escape heat. Its body is streamlined and it has large feet and “fringed toes” that allow it to run on its hind feet across the sands up to 15 mph. Researcher Dale Turner found that the lizards’ diet included 65 taxa of arthropods (ants, beetles, spiders) from 39 families, along with the leaves, seeds, and buds of 13 plant species. The lizards live among creosotebushes, white bursages, big galleta, and other dune plants. Its name derives from Fort Yuma, from where natural history specimens were shipped in the 1880s, and rufopunctata for its pattern of rust-colored dots. Mile 32.0. 32°36’19.9”N, 113°46’24.6”W. Rescue beacon and a good place to park for walking ½ mile east to the dunes and another ¾ mile to the crest (distances are one-way). Get acquainted with specialized dune flowers like primroses (Oenothera primiveris), sand verbena (Abronia villosa), Ajo lily (Hesperocallis undulata), and sand loco weed (Astragalus insularis). Sand for the dunes comes from the Gila River. 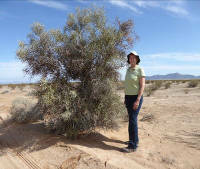 A study by researchers Richard Felger and Dale Turner identified 122 species of seed plants, representing 95 genera and 35 families in the 19,000-acre Mohawk Dune Field and its immediate surroundings. The dunes (including interdune swales) support 78 species. The adjacent non-dune habitats (sand flats and playa) support 109 species, of which 43 were not found on the dunes. Of these dune annuals, 53 species (84%) develop during the cool season. While no plant taxon is endemic to the Mohawk region, there are 8 sand-adapted dune endemics: dune cryptantha (Cryptantha ganderi), dune spectacle-pod (Dimorphocarpa pinnatifida), bugseed (Dicoria canescens), saw-toothed ditaxis or Yuma ditaxis (Ditaxis serrata), big galleta (Hilaria rigida), Emory’s indigo-bush (Psorothamnus emoryi), Schott’s wire-lettuce (Stephanomeria schottii, for Arthur Schott, artist on the Emory boundary survey of 1854-1858), and fanleaf crinklemat (Tiquilia plicata). Two non-native species in the dunes, Sahara mustard (Brassica tournefortii) and Arabian grass (Schismus arabicus), pose serious threats to the dune ecosystem. If the day is warm or you have small children, you may choose to wait until Miles 39.7, 40.1, or 40.6 for a much easier chance to stand atop a dune – you will drive over them. Mile 37.4. 32°40’04.1N, 113°49’48.4”W. Unusual tree right next to the road. Meet Castela emoryi, one of three aridland species commonly called crucifixion thorn. The spines are exceptionally stout and the tree is drought resistant. The seeds do not fall far from the parent tree, so these trees grow in clusters miles from others of their species. From a distance they resemble “strange” paloverdes. Look for shrikes posted on top branches. Named for William H. Emory, who led the American team that surveyed the US-Mexico border beginning in 1854. Mile 38.4. 32°40’46”N,113°50’27.6”W. Goldwater Range northern boundary. The military has your safety in mind. Obey all warning signs. You may have seen few or no other people on your visit across the Camino, but many people, agencies, and organizations pay close attention to it. Foremost is the Goldwater Range Interagency Executive Council, a partnership of several dozen agencies that meet at least three times a year to discuss common issues and shared projects. Members include state and federal agencies, municipalities, and tribes, as well as Customs & Border Protection and the Arizona Game & Fish Department. Other groups such as Friends of the Sonoran Desert, Defenders of Wildlife, Sierra Club, Humane Borders, and Arizona Desert Bighorn Sheep Society regularly attend, and the public is always invited. The Goldwater Range plays a crucial role in national defense and the state’s economy, and its use of the land is authorized by Congress, with renewal of the “lease” coming up for approval again in 2025. More information will be forthcoming on the Range website. The Goldwater is America’s third largest military reservation, and one of the most complicated to manage. It sits on the border of a foreign country with migrants from around the globe trying to cross the border illegally, sometimes smuggling drugs or contraband. The region’s population is booming, and citizens press for recreation on the Range. Endangered species must be protected. The military flies a wide range of missions here from bases near and far, complicating coordination of the airspace. And, the climate is changing, affecting everything from the plants and animals to the flying operations. There seem to be a million moving parts and concerns. However, the military operation here is highly successful, in large part due to cooperation and help from its neighboring agencies, such as National Park Service, US Fish and Wildlife Service, Bureau of Land Management, Border Patrol, and Arizona Game and Fish Department. The Range is a model of collaboration and efficiency. In fact, in the most recent recognition of these partnerships the Goldwater Range was awarded the 2016 US Fish and Wildlife Service Military Conservation Partner Award for working closely with its range partners to “provide exemplary landscape-level stewardship for diverse and rare natural resources including three federally protected species: Sonoran pronghorn, lesser long-nosed bat and acuña cactus.” The National Park Service at Organ Pipe received the 2015 Director's Wes Henry National Wilderness Stewardship Awards for group and individual work. Cooperative projects include establishment of a regional weather network with remote, self-reporting stations providing temperatures, wind speeds and directions, soil moisture, and precipitation in real-time. 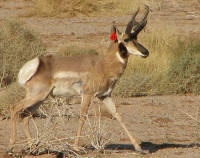 Sonoran pronghorn are being restored back to viable herds by captive breeding and releases beyond their current range – this noble effort includes agencies in Mexico. Researchers also are seeking ways to reduce the spread of invasive species, to understand ancient peoples, to monitor water quality at game waters, and to understand landscape changes, including those generated by military training, Border Patrol operations, and illegal border crossings. Mile 39.6. 32°41’38”N, 113°51’00”W. Key Junction. Turn west (left) to reach Wellton and I-8. Be cautious cresting hills – oncoming traffic is blind. This intersection is locally known as Buster’s Pole, for Border Patrol agent Walter “Buster” Hummel, who successfully apprehended a group of smugglers here at night, despite high-centering his blacked-out vehicle on a well-casing pole that once stood bumper-high in the center of the roadway. The pipe was later cut to ground level, with a section being mounted onto a plaque for Buster. As you go…. Miles 39.7, 40.1, or 40.6: The road crosses dunes that can be enjoyed by children of all ages. On a windy day you can watch ripple waves form and feel the power of wind-driven sand, though the dune as a whole is relatively stationery. To the northeast you may notice a knob-like peak called Mohawk Peak. Its O’odham Indian name, Kuswa Toob Do’ag, means “twisted neck mountain” for its resemblance to a headless chicken or bird. As you go…. Mile 40.3: A “forest” of crucifixion thorn trees (Castela emoryi). In many places this road has become a de facto riparian zone with larger, denser vegetation and more habitat for birds and other animals. Mile 41.3. 32°41’38”N, 113°52’46.1W. Note large open area of Colfred runway along both sides of the road, one leg of a triangle-shaped airfield built for training military pilots in WWII. A number of these auxiliary fields dot the Southwest. This one is now private property. The name comes from a nearby railroad siding named for Colonel Fred Crocker, treasurer of Southern Pacific Railroad in 1881. As you go…. Mile 41.7: A second leg of the Colfred landing field triangle. On right is a remnant of a once vigorous jojoba field, an oil-rich bean grown in 1980s-1990s for cosmetics and special industrial oils. The demand did not meet expectations. As you’ve probably already noticed, the largest jojobas are roadside. Rainfall is this area is about 3 to 4 inches a year. As you go…. Miles 42.0 to 42.5: Notice that creosotes are slowly reclaiming a fallow jojoba field, but it will take many years for the ground to become natural desert again. Mile 45.5. 32°41’30”N, 113°57’11”W. Tacna interchange: County Road 40E and Interstate 8 (also Highway 80). Paved road 40E is 40 miles east of Yuma. The town of Tacna north of the interstate and railroad offers fuel, food, and lodging. Turn east on I-8 for Gila Bend, Phoenix, Tucson. Turn west for Yuma, El Centro, San Diego, and Los Angeles. "For the first time in our lives, perhaps, we had spent five almost noiseless days, viewed miles of uninterrupted scenery, untouched, uninhabited, unwanted because of one thing, the lack of life-sustaining water." Yuma Crossing National Heritage Area (32°43’43”N, 114°36’56”W. 201 North Fourth Ave, Yuma). Regardless of whether you return by way of Tacna, Wellton, or Fortuna, you may wish to complete your trip with a visit to Yuma Crossing, where early travelers crossed the unpredictable Colorado River and modern travelers enjoy water sports, historical buildings, dining and hotel accommodations. Because of a favorable place to cross the Colorado River and raise crops, this area – homeland of the Quechan – was a hub of Native American activity and trade. Abalone shell was brought from the Pacific coast to people living in what are now Phoenix and Tucson, and other goods flowed back and forth. The Colorado River tribes traded with Pacific coast and inland tribes, receiving, among other items, abalone shell eventually used by Hohokam jewelers in south-central Arizona. Gabrieleños of the Los Angeles basin and Channel Islands traded sea shells, steatite, and other items as far east as central Arizona, generally by way of middlemen. 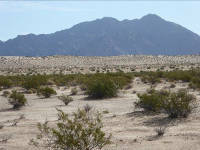 The Kitanemuk of the western Mojave Desert traded with the Quechan along the lower Colorado River. The Cahuilla, who lived northwest of the Salton Sea, were specialized traders who visited as far east as the Gila River to obtain goods. The first Europeans to visit Yuma Crossing arrived in 1540, when Hernando de Alarcón led a small band of sailors up the Colorado River in support of Francisco Vásquez de Coronado’s expedition into the Southwest. They were surprised to learn that the local Indians already knew about Coronado’s concurrent expedition in northeastern Arizona, were familiar with the Zuni, used Hopi cotton textiles, and possessed buffalo-skin robes from far away. A parade of padres, soldiers, and settlers followed en route to explore and settle in California. Over the next five centuries, significant events at Yuma Crossing influenced the development of Arizona, the Southwest, and the nation. The crossing and the Camino del Diablo are time-honored legacies in the histories of America, Mexico, and native nations. The Yuma Crossing National Heritage Area boasts two state historic parks, one National Historic Landmark (Yuma Crossing and Associated Sites), the Anza trail, two new riverfront parks connected by a multi-use path, 350 acres of restored wetlands, and an interpretive plaza that tells the many stories of the Yuma Crossing. Amenities and services are available for the perfect conclusion to your drive through history. Activities include dining, hotels, pubs and night life, canoe trips, bicycle and walking trails, bird watching, river tubing, nature trails, farmer’s market, and tours of the historic Army Quartermaster Depot and Yuma Territorial Prison.